Reading soothes my mind and reminds me that I am not alone. I am aware that reading benefits me, but just recently, I found research that supports a connection between mental health and reading. 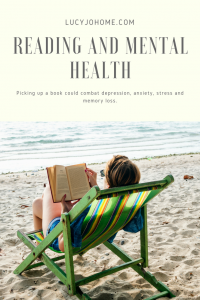 I wanted to share some of this research to validate those who use books to help themselves with mental health right now and to encourage others to read to help themselves through things like stress, anxiety and depression. Bibliotherapy uses books to help improve well-being. In Scotland, there is a public library that offers not only the books, but also a bibliotherapist that assesses the participants and prescribes books. Most of the participants reported mental health improvements after using the service (Guha and Seale, 2015). In three European countries, they have created an organization called “Books on Prescription” that provide self-help books for people who deal with mental health issues like depression and anxiety. Some of the users with depression complained of not being able to concentrate on the cognitive behavioral self-help books, but still wanted to read—light, escapist literature (Guha and Seale, 2015). It would be very cool if bibliotherapy was a common services at our public libraries. Bibliotherapists could prescribe books and give patients more options to fight mental illness. Another study was done through a Massive Open Online Course [MOOC] called Literature and Mental Health. The course included learning how to use poetry to reduce stress, a survey of what people read for well-being, a missing word activity and a poetry and memory activity. Although the participants evaluated were already inherently interested in the topic since they signed up for the course, those that interacted with the course most recently reported reading more and a broader variety of literature. Then, after the course, some students went as far as distributing poetry in a “clinical waiting room,” suggesting the course to others, using knowledge taken from the course to help their family with mental health problems and creating boards at schools to educate others about mental health and literature. The course also had the highest comments per learner over all the other MOOC’s available (Hodge, 2016). Actions were taken after the course to distribute the ideas, and I believe these results show that more research could reveal stronger connections between literature and mental health, just maybe with a more random selection of people. After a visit to my therapist, I asked her what she liked to read, and she said she read light chic-flick type books because her job was mentally taxing. In a world full of distractions and pressures to be good at everything, I think reading is super important because it usually does calm a troubled mind or give perspective just at the right time. If your mind needs a break pick up a book that could help you combat stress, depression, memory loss and anxiety. If you have a therapist you could ask for suggestions from them, or many times, I think our intuition can help us make good book choices. If a book isn’t making you feel better, put it down and find another. You can always keep a list of books you want to read when you feel up to tackling a more intense book. I recently read A Gentleman in Moscow and The Demon King. The first is a well-written fictional account of a man who is being held at a hotel as punishment for a “rebellious poem”. The whole book focuses on him and his relationships with other people he encounters within the hotel. I like the book because it helps me to realize that no matter my circumstances, or in this case, setting, I can and should focus on cultivating relationships. Even under house-arrest, the main character is able to live a fulfilling life by serving and connecting with others. This book was thought-provoking and took a bit longer to read. I was left better for having read it. The second book, The Demon King, is a recommendation from a friend. I told her that I didn’t really like fantasy, and I think she took it as a challenge. I am glad that she did. It was a fun read, and I actually want to read the sequel, which is really saying something considering I have yet to finish a book series…yes, I started and didn’t finish Harry Potter, Lord of the Rings or Chronicles of Narnia series. The Demon King provoked less thought and engendered more entertainment and escape for the mind. The book took me to a different world (that seems real while you are reading); there is wizards, folklore, truth to be uncovered, danger lurking and complicated romance blooming. This book was just as therapeutic as considering my purpose and existence because it allowed an escape from my busy life and helped me slow down. I hope some of this information will convince you that reading is fun and important for your well-being! Combine reading with writing, exercise and discussion for a more powerful solution to mental health. Happy reading and healthy minds! Guha, M., & Seale, L. (2015, October). “Reading maketh a full man”. Journal of Mental Health. pp. 257-260. doi:10.3109/09638237.2015.1078886.